Last week Bill and I went for a ride to the coast. 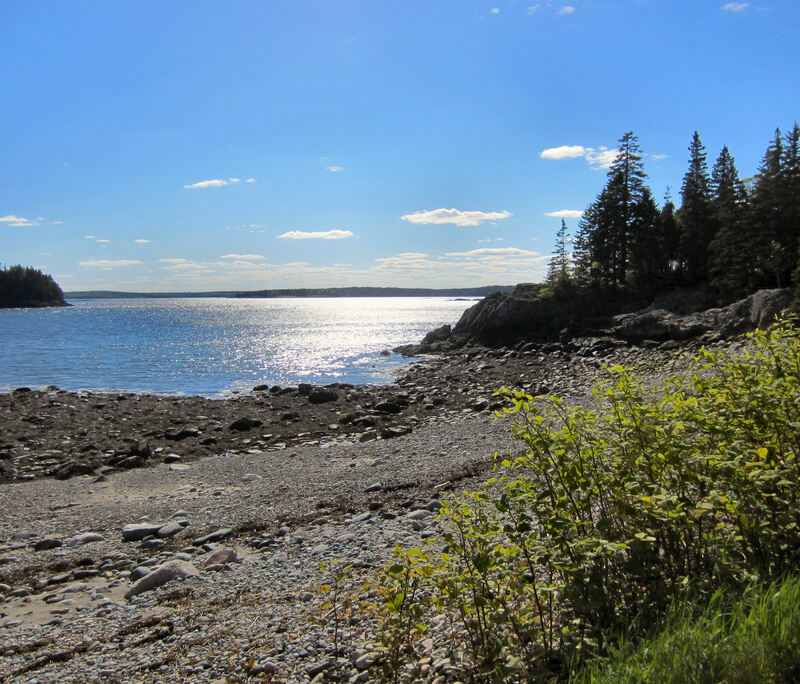 We headed out to true “Downeast” Maine – Washington County and Machias in particular. 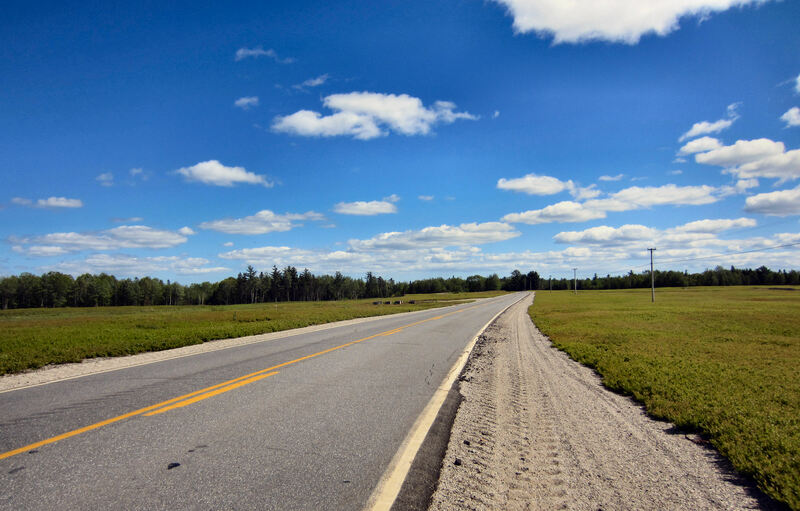 After a 2 1/2 hour drive through the country side with its quaint farms, we knew we were getting close when the road started through the Maine Blueberry Barrens. 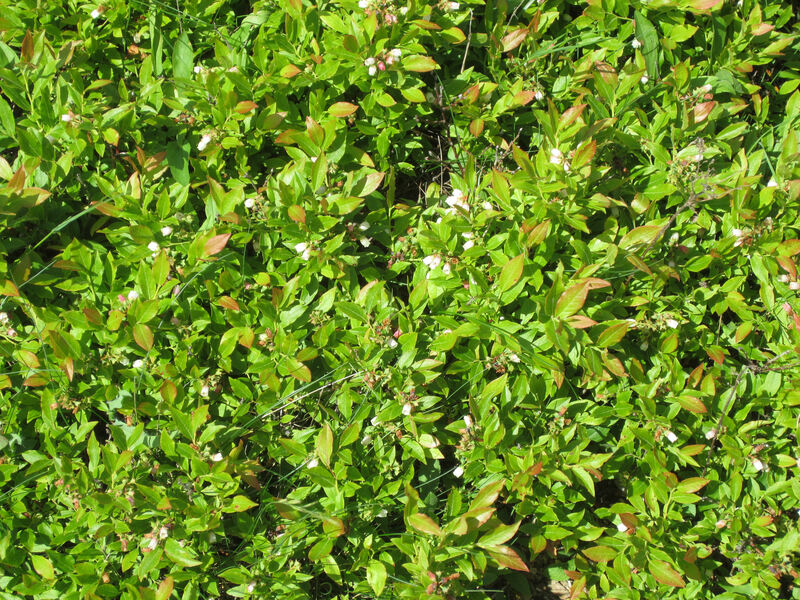 Acres and acres of open blueberry fields, dotted with bee hives, and just blossoming blueberry plants finally gave way to the coast. Beehives dot the fields in the downeast Maine blueberry barrens. The blueberry farmers depend on the bees pollinating help to ensure a good blueberry harvest in August. 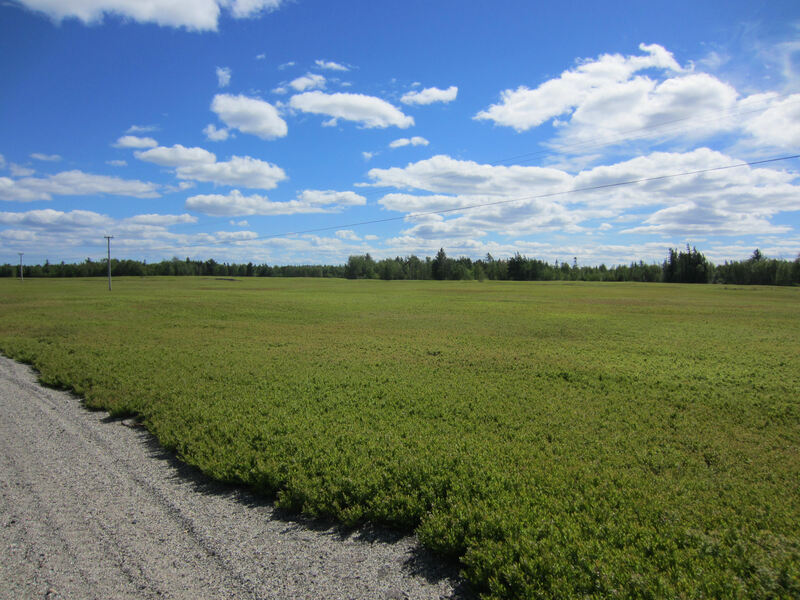 Miles and miles of fields ready to produce the tastiest blueberries on earth. Trust me, there is nothing more delicious than Maine Blueberries in season and fresh from the field. They’re a whole lot different that the imported berries you buy in the stores out of season. 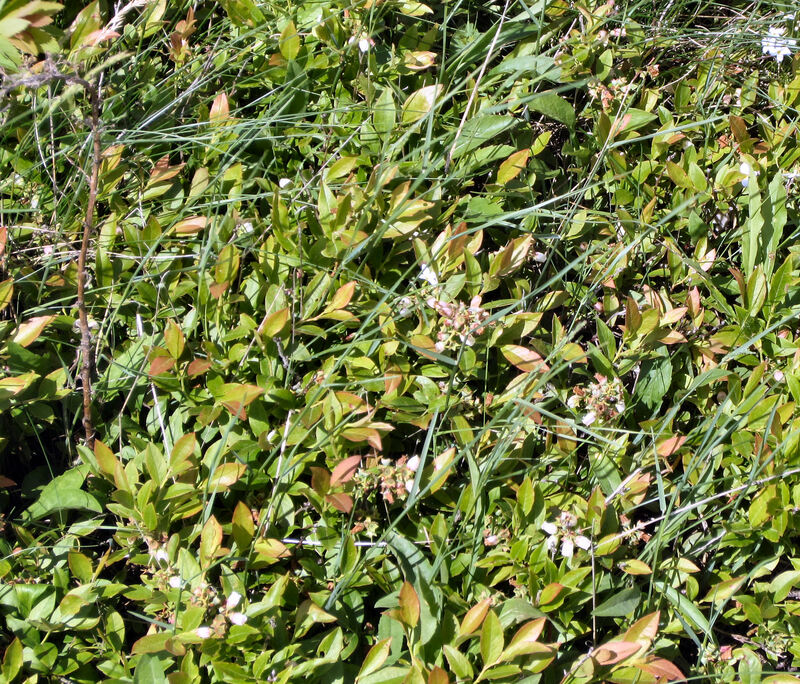 These little blueberry blossoms near Cherryfield, Maine are the beginning of a process that produces the best blueberries in the world! It’s time for Maine LOBSTER! Our destination was Machias, and in particular, The Bluebird Ranch, a little family restaurant with the best lobster rolls this side of heaven. We visit that restaurant twice a year once in May/June for lobster rolls and then we make another trip in early August in the height of blueberry season for their famous fresh blueberry pie! After stuffing ourselves with lobster rolls (Bill had 2 …..yikes! ), we went exploring along the coast. We like to take the “off the beaten path” approach and take obscure little roads that take you into hidden coves and right down to the sea. This time we ended up on a wonderful little peninsula called Ripley Point. 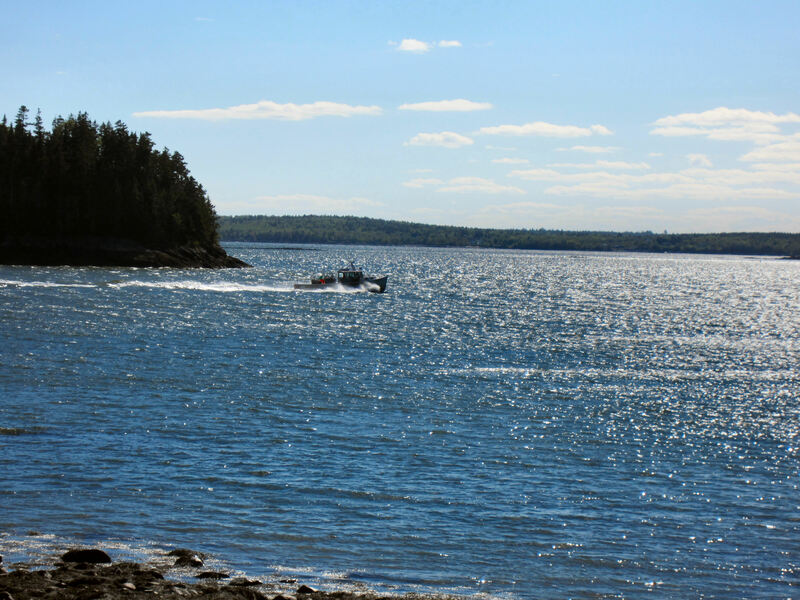 A Maine lobster boat speeds along the Maine coast to get its precious cargo of fresh Maine lobsters to market. It was so picturesque and very, very Maine coast. At the very end of the road was a little enclave of weathered shingled Victorian cottages with the most incredible views of the Atlantic and coastal islands. This adorable little cottage was separated from the rest and had its own private view carved out of the woods. Here’s the cottage…..
…and here’s the view. 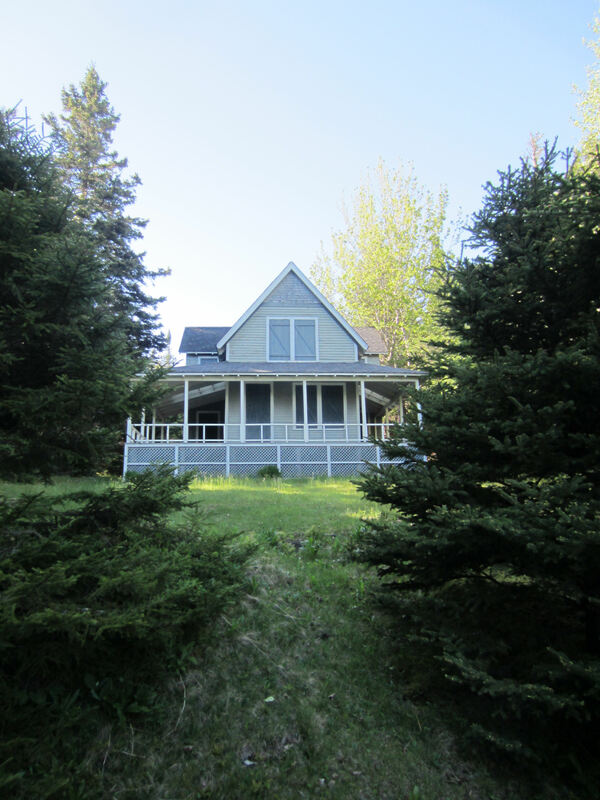 oh I would love to sip my morning coffee on the porch of that cottage and watch the sun rise! There was a strip of rocky beach that we walked looking for sea glass and other treasures. Bill found a couple of interesting rocks that we brought home to put in the garden. I love living where we do in the inland forest, but I wouldn’t mind having a place on the coast. Listening to the surf crash on the rocks, the clanging bell of a buoy just off the shore, and the fog horn from a distant lighthouse, and the smell of the salt air………..just puts you in another world. We found this perfect little rocky beach when the tide was out so we could look for all sorts of treasures along the Maine shore. A man and his thoughts…. 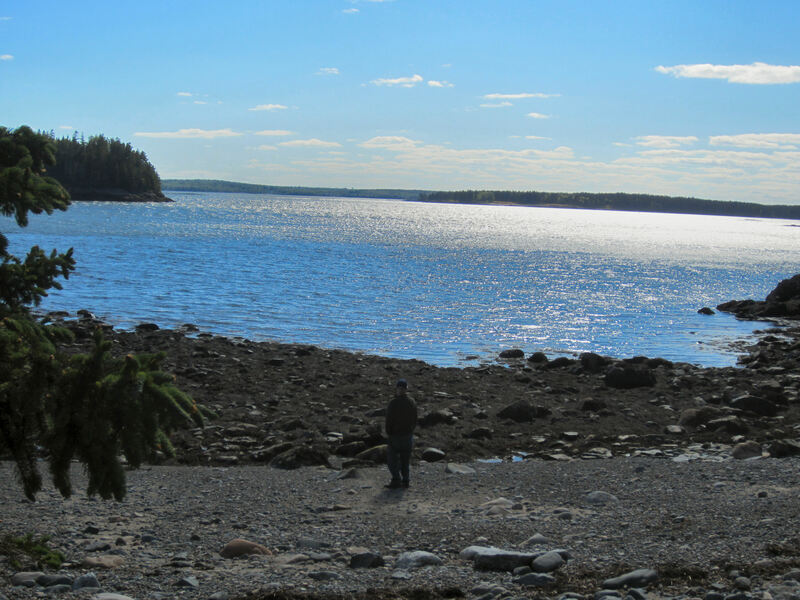 Bill as he is beach-combing at Ripley Point in Downeast Maine. 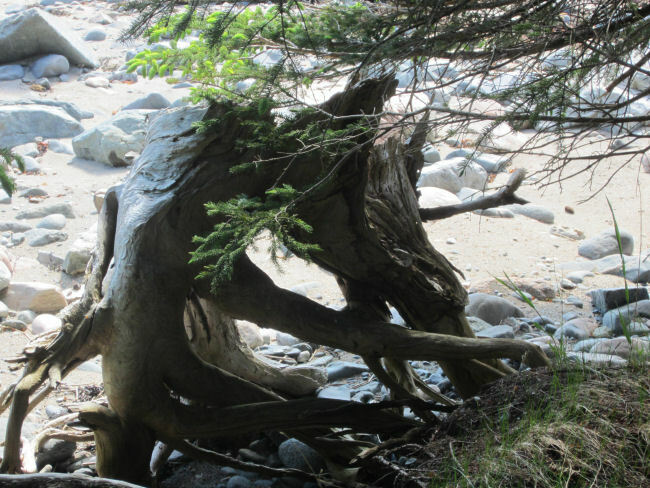 I found this driftwood stump that had washed up on the shore. I really wanted to bring it home to tuck in the garden but we had the Jeep Wrangler and it just wouldn’t fit in the back. It’s one of the few times I wish we had brought Bill’s pickup truck. 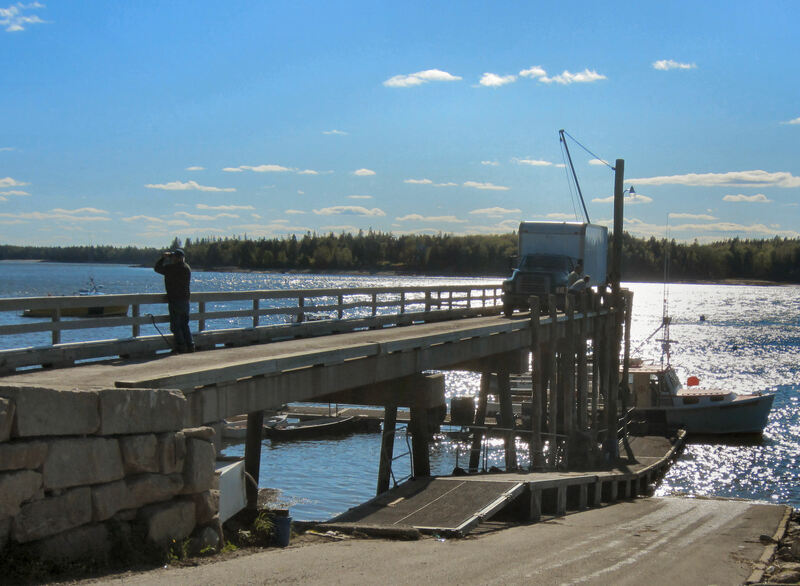 On our way back to Route 1, the coastal highway, we stopped at the Ripley Point town docks and watched them unloading a lobster boat. The Town Dock at Ripley, Maine. They are unloading a lobster boat of its very precious, very yummy fresh cargo! There was this tiny little building out on an island. It really stirred my imagination thinking about why someone built it where they did. This little cottage would be a wild place to be when a storm comes in. This picture is at low tide…can you imagine high tide with the Atlantic Ocean crashing around you and the winds howling! Time was passing and as late afternoon came, we had to head back to the Katahdin region. It was a glorious day. I wish you could have been there with us. If you ever come to Maine, get a copy of the Delorme Maine Atlas and get off the beaten path….it’s where you’ll find the true treasures of our incredible State. It gives you maps that show every hidden dirt back road in the state of Maine, and trust me, that is where the fun discoveries are! Great pictures. Thank you so much for sharing with Adorned From Above’s Link Party. We can’t wait to see what you have to share with us this week. Haven’t been there in quite a while but my husband was born in Eastport & still has relatives in Bangor,Pembroke & Meddybemps, ME. He recalls picking blueberries, digging potatoes & tipping fir trees for wreaths so that he could make a little money as a young boy. Blueberries definitely are a huge commodity in Maine. Love the Downeast area of the State. Thanks for the story & pictures ~ I really enjoyed them. What a wonderful adventure! Nothing like fresh fruit that’s for sure. 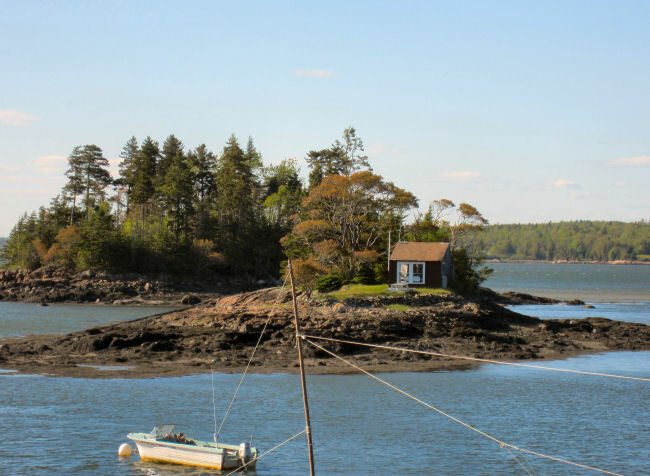 I have never been to Maine, but it’s on my ‘go to’ list. Love Lobster and have not had a lobster roll. Sounds yummy. Hope to try one someday! Thanks for sharing the beautiful scenery with SYC. Beautiful pictures! Thanks for partying with us. I’ve always wanted to visit Maine! Wonderful photos! Looks like you had wonderful road trip. I would love it if you would share with us at Photog Show and Tell Link Party. I feel blessed to live in Maine. It is an incredibly beautiful and diverse state. I made this trip years ago. So beautiful and peaceful and filled with great lobster! I host a weekly link party called “Oh, the PLACES I’ve been!” and would love to have you link. You could link each of your stops on different weeks into the future. The link goes up on Thursday evening EST at 7 pm. Hope to see you then! I’ll be sure to be there! And yes, I agree there is nothing as heavenly as Maine lobster! I live in Pennsylvania, but I am originally from California. I have yet to travel that far up the East Coast. However, it is definitely on my bucket list. I’m a new follower from the Thursday Favorite Things Link Up. I hope you have a wonderful day & a fantastic weekend! Well you need to take a road trip up the New England coast! 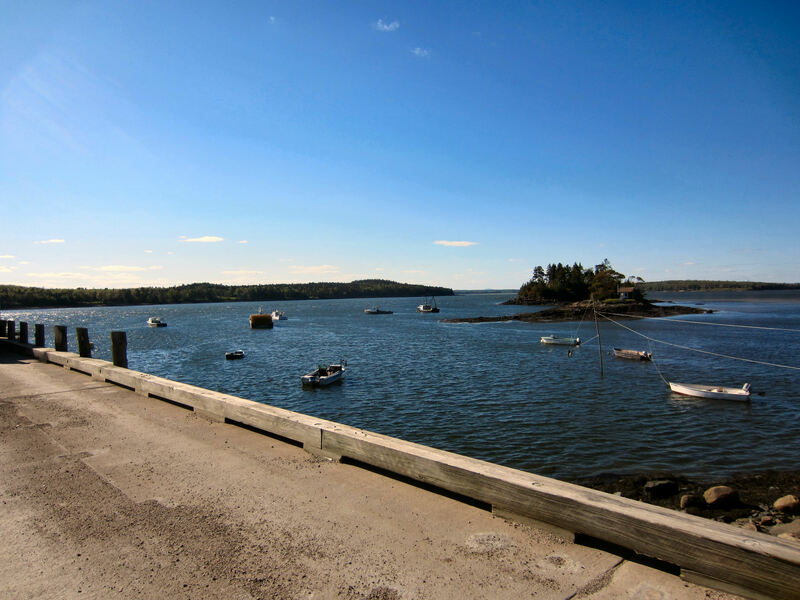 The Downeast Maine coast will offer you the most peaceful and pristine coastline that isn’t as commercialized as more southern areas of New England. Such beautiful pictures! A visit to the East Coast is on my bucket list. I live out here in California and love to visit our beaches also. Glad you had a great trip! It should be on everyone’s bucket list! It’s a beautiful state with an interesting history! Beautiful shots. We travel the New England coast year ago last May while they were experiencing the unusual warm spring. It was our first time in that part of the US and we LOVED it. I had so much fun posting my shots at the end of each day. (Google Joy’s Jots Shots 2012 Spring Vaca – It goes from Day 2 to 13) I hope to go back some day. Thanks for sharing your experience. We never did find a spot on the shore to stop like you have. It must be a secret. enJOYed this post very much. The secret is the “Maine Atlas” that I mention at the end of my post. Before you go exploring in Maine, be sure to get one. It shows every obscure little dirt road in the state. That’s how we find spots like that one in the photos all the time, and its so much fun seeking them out. Sheryl, thank you for this fun and picturesque tour! 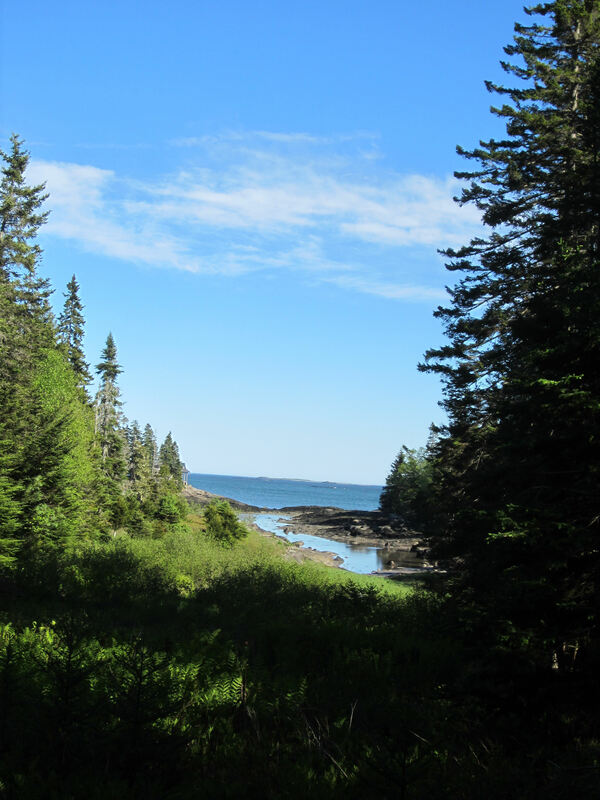 We loved our road trip down the Maine coast a few years ago–and I can still taste the luscious lobster rolls 🙂 I know exactly what you mean about where you live…if only we could combine the best of both worlds with beach and deep forest on the same piece of land! Maine is such a wonderful state to live in. I am truly blessed and I do love the the fact that I can be in the mountains, or at a pristine lake, or beach-combing in a couple of hours in any direction.